The four-hour long 2016 Olympics Opening Ceremony in Rio had a slashed budget (12 times less than the budget for 2012’s London ceremonies and 20 times less than 2008’s Beijing ceremonies according to the Washington Post), but that didn’t hold the Brazilians back. With the beautiful seaside as a backdrop, Rio pulsed with lights, fireworks, circus-like acrobatics and a stadium-wide sing along that embraced the nation’s festival atmosphere. So, what did we learn from this awesome event? And find creative ways to shine! The Opening Ceremonies didn’t rely on expensive mechanical tricks or ostentatious high-tech display. Oscar nominated director Fernando Meirelles, one of the creators of the event, described the strategy as “analogue inventiveness”. Whether we like it or not, and somewhat relative to the folks in Rio, most of us have “Champagne dreams on a Bud Light budget” when planning our large meetings and corporate events. We’re required to scale back on the number of people we’d like to invite, the level of entertainment and speakers we’d hope to include and, often times, many of the AV and related staging elements. That doesn’t mean our event has to suffer. Like Rio, we too can be creative. For instance, rather than including your guest speakers live, the technology and interactive solutions are now in place to stream them in virtually for a fraction of the investment. Additionally, consider shifting some investment from costly onsite production equipment to high return pre and post-event communication that helps prime and sustain engagement. Think back to four years ago at the closing ceremonies of the London Olympics. At that time, leaders from Rio were on-hand and the torch was literally and symbolically passed to Brazil. Since then, after the Winter Olympics in Sochi in 2014, and especially at the beginning of 2016, communications across television, print and social media escalated to the point where you’d need to be living under a rock to not realize that the Olympics were taking place. These meetings are not just about the lights and sound onsite. Yes, these elements are important and help further the message. By also placing time and energy on the arc of your story for the experience, the intended outcomes and proposed journey for your stakeholders is much more clear. This journey doesn’t begin a few weeks before your event, and the pump is primed with a quick “Save the Date”. Like the Olympics, consider the extended experience that truly begins when your prior event ends and requires ongoing touch points and supporting campaigns leading up to the event itself. Fully-leveraging its undeniable, natural beauty and warm, energetic style, Brazil played to its strengths. With references to the jungles of the Amazon, the white sands of Copacabana beach and its cities that never sleep, Rio’s festivities reached a climax with a stadium-wide dance party. Even Gisele Bundchen made an appearance and strutted her stuff on what she referred to as her longest catwalk ever. So, who is your Gisele? Who are those folks that are awaiting their moment in the spotlight either as an emcee, opening talent, or as a profile story to help bring more humanity to your brand? From a culture perspective, give thought to how you showcase your values, your history, your special sauce, etc. This could be done through competition or even improv. Be willing to take a risk and challenge your leaders to do the same. It wasn’t all about celebrities, exciting music and captivating light shows during the Opening Ceremony. The directors of the experience openly displayed the darker side of Brazilian history – from slavery to the creation of seedy megacities to the ongoing destruction of the environment. What are those elephants in the room or tough topics across your business that requires candid and open discussion? This could be done in General Session, in breakouts, or both. The key is to create transparency and to do so as early as possible to create trust among your team and ensure these sensitive issues don’t fester throughout the experience and especially afterwards. Representing 206 nations, 11,000 boisterous athletes celebrated and showcased the many colors and styles from their homelands as they marched in the Parade of Nations. Although a few past athletes led the torch lighting, ALL athletes had their moment. How are you involving all your people during the meeting? Rather than passively sitting in their seats and listening to others talk at them, are all your attendees given an opportunity to actively engage? By developing creative challenges before the meeting, you can identify those folks who should be sharing the stage with your senior leaders. And through audience response systems, text to screen and social media integration, you provide a channel for everyone’s voice to be heard. Don’t limit your ideas to only those people at the meeting. How do you plan to connect with the non-attendee, those folks on the front line that your meeting attendees are representing? It’s your chance to go for gold! In the same way that Rio has gathered the entire world together, you’ve gathered your brand together in a meaningful way – make it count. 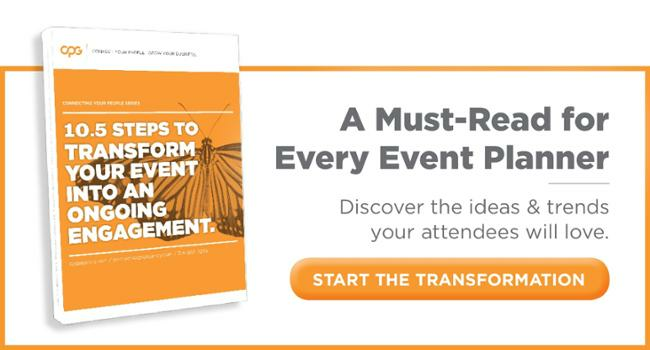 CPG can help you find the most value for your budget and ensure your attendee journey helps engage your people before, during and long after your event. If you lather up your body in a vat of baby oil, you and your event will surely be a viral sensation!